Home » August 24 is Scaredy Cats Day…for Cats that Don’t Like the Vet! ***Media: Press release available here. Did you know that only 50% of cats receive regular veterinary care, compared to 80% of dogs? 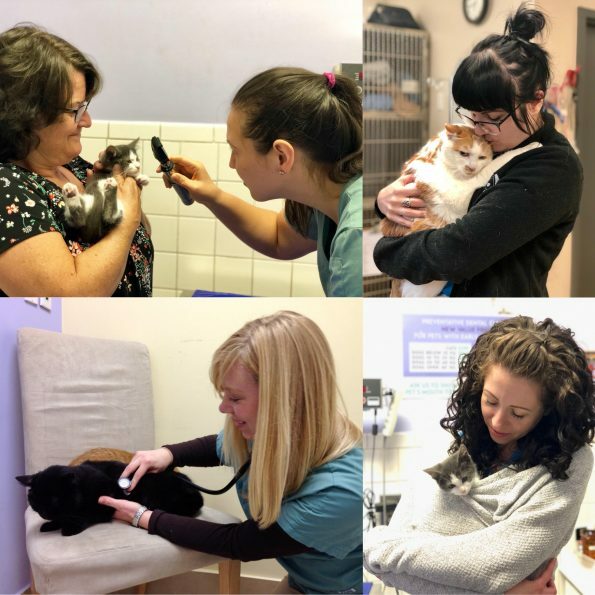 Cats deserve vet care too, but we know that carrier challenges and stressful visits in the past can discourage owners from bringing them in for regular check-ups. If this describes your cat, Scaredy Cats Day is for you! Limited appointments available, so call, email, or request your cat’s appointment online now! Why do regular exams matter? Cats are excellent at hiding signs of pain and illness, which means that by the time they look unwell their health problems can be quite advanced, and they may have been in discomfort for some time. Take advantage of Scaredy Cats Day and book your cat’s appointment now! P.S. If you aren’t available on Friday, August 24th, we can offer your cat a fear-free visit on other days too – just ask when you call to book, and we would be happy to help!